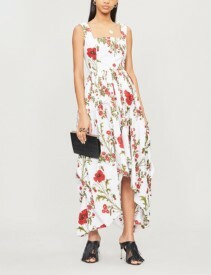 When you’re switching high heels for bare sandy feet or sandals, these beach wedding guest dresses are simply perfect. Mirror the natural beauty and simplicity of this romantic setting and opt for soft textures and natural prints. This is an occasion for which you can afford to be a little more playful and romantic with your dress choices. 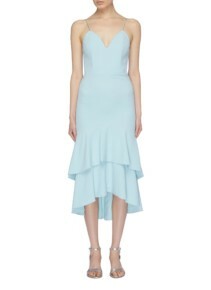 Whether you’re part of the wedding party or even a plus one, our edit has the ideal dress for you. 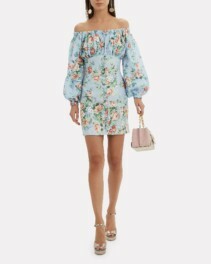 It’s not always simple finding beach wedding guest dresses that feel appropriate for a ceremony and compliment your surroundings. That being said, it does provide a slightly more relaxed brief for your search. Where you might normally be fitted and formal, a beach wedding calls for a more romantic, bohemian style. 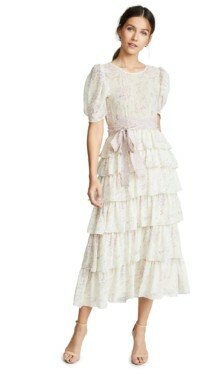 The Poppy cotton-poplin midi by Alexander Mcqueen is an exemplary dress for this particular occasion. The natural floral poppy print gives this dress an instant outdoorsy vibe whilst the asymmetric hem feels fittingly organic. The square neckline is incredibly flattering which combined with the voluminous skirt provides the perfect balance of structure and simplicity. 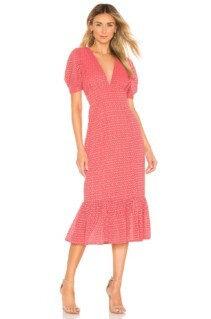 This dress also has a defined waistline to ensure a shapely silhouette. 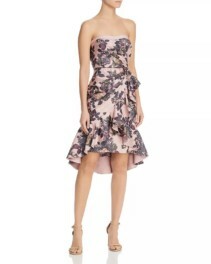 Style this dress with metallic sandals for your loved one’s upcoming nuptials. The Kendall silk dress by LoveShackFancy is so beautiful you’d consider wearing it to your own beach wedding. The soft orange silk glides over your figure elegantly and effortlessly for a perfectly chic and understated appearance. The low V back and neckline compliment your figure whilst the thigh high split allows elegant and fluid movement in the skirt. We also adore the delicate ruffles that line the bust and the pretty self-tie back that defines your waist so beautifully. 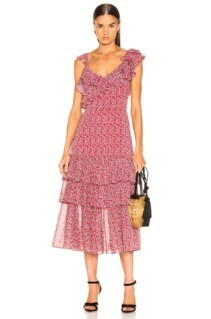 If the happy couple is heading abroad for their nuptials then these beach wedding guest dresses are ideal. 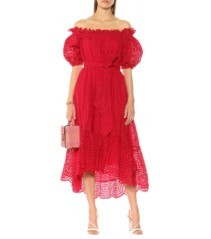 You’ll be incredibly stylish and comfortably cool in the asymmetric fringed red dress by Johanna Ortiz. The metallic fringe on the asymmetric skirt combined with voluminous ruffled sleeves is truly striking. These features combined with embroidered red silk crepe, a plunging V back and neckline make this dress an absolute showstopper. For a more fitted silhouette that still makes a statement, opt for the Bowie mini blue dress by Zimmermann. 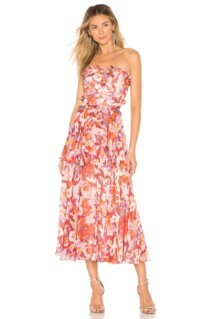 The off the shoulder neckline and and mini hemline make this dress ideal for a warm beach wedding. Additionally, the vintage style print, pretty blouson sleeves and delicate button closures are undeniably romantic in nature. 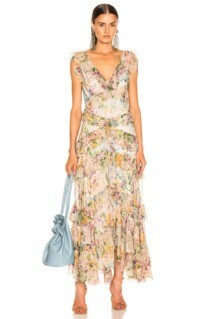 Style this dress with sandals and a delicate pastel handbag.